Marine litter (sometimes called marine debris) is any persistent, manufactured or processed solid material which is discarded, disposed of or abandoned in the marine and coastal environment. Marine litter consists of mostly very slowly degradable waste items such as plastic, polystyrene, metal and glass. Marine litter is found on the beaches and shores, on the water surface, in the water column and on the seabed. It can be found near the source of input but also be transported over a long distance with sea currents and winds. Marine litter causes marine environmental, economic, health and aesthetic problems, including possible transfer of toxic substances and invasive species, destruction of marine habitats and loss of biodiversity. It also threatens marine life through entanglement, suffocation and ingestion as well as poses a risk to human health and life. NOWPAP MALITA was started after its approval at the 10th NOWPAP IGM in 2005. 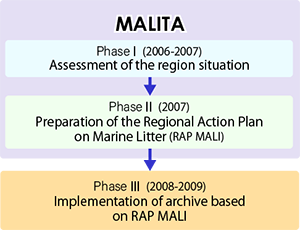 It aimed to collect and share information on marine litter in each member state and develop the NOWPAP Regional Action Plan on Marine Litter (RAP-MALI). NOWPAP member states conduct National Monitoring on marine litter on beaches or clean up events. Monitoring data is submitted to CEARAC to be uploaded into DINRAC Marine Litter Database after compilation and harmonization at CEARAC. In the initial stages when activities on marine litter were started in NOWPAP, Japan and Korea conducted monitoring survey on marine litter. To enhance monitoring activities in the member states, CEARAC developed Guidelines for Monitoring Marine Litter on the Beaches and Shorelines of the Northwest Pacific Region. Tourists and recreation activities are one of the main sources of marine litter generation. Therefore, CEARAC developed guidelines for tourists and tour operators. The Guidelines for Tourists and Tour Operators in Marine and Coastal Areas was ipdated in 2011. A large volume of plastic marine litter exists in the sea area around the world. However, it is difficult to reduce and recycle such plastic litter. This booklet provides useful information and best practices on recycling of marine litter. Ministry of the Environment, Japan conducted a model survey for reducing marine litter in order to understand the current situation in detail and to consider the countermeasures against marine litter generation, including effective collecting and treating methods. Most of land-based sources marine litter are generated from daily life of people. To reduce generation of marine litter, it is important that people understand marine litter problem and take actions. As a public awareness material for reduction of marine litter generation, CEARAC developed public awareness materials. Northwest Pacific Regional Environmental Cooperation Center (NPEC), host organization of CEARAC, and Regional Coordinating Unit (RCU) of NOWPAP established the Northwest Pacific Regional Node of the Global Partnership on Marine Litter was established with support by Global Programme of Action for the Protection of the Marine Environment from Land-based Activities (GPA). This regional node aims to enhance awareness of marine litter prevention actions at the national, local and grass-root levels as well as to exchange information among stakeholders. Not only basic information on marine litter but also monitoring survey data and actions by NOWPAP member states are provided through this regional node. Copyright NOWPAP CEARAC. All Rights Reserved.